Under the finance proposal all eight remaining positions would be eliminated no sooner than Jan. 31, 2016. The company proposes to meet with the Guild 60 days prior to implementation and negotiate the effects outsourcing would have on the employees scheduled to be displaced, meaning they are willing to negotiate a separation package at a later date. Under the metro home delivery proposal, the company would gain the right to outsource the work of the current 24 District Managers and 21 Assistant District Managers. As proposed by management, the most likely model for subcontracting the work would be to contract with 13 or so “Super Agents” that would each manage 20,000 to 40,000 customers. The Super Agent subcontractors would not be employees. They would be paid a set amount of money to get the papers delivered and would be responsible for hiring their own employees, contracting their own carriers and handling pay and bookkeeping for their distributorship. The rollout would be in phases over a three- to six-month period. Displaced employees would receive full severance and the equivalent of three months of medical insurance subsidy. The Guild committee asked several questions about each proposal and expressed doubt about the wisdom of the planned outsourcing. Guild representatives notified the company that if the union was to entertain the outsourcing of finance, the separation terms and all other conditions would need to be negotiated in these contract negotiations, not at a later date. The Guild notified the company that a list of questions concerning the company’s proposal will be submitted and the union will present counter-proposals at the next bargaining session, scheduled for Aug. 19. Guild Non-newsroom Bargaining Committee: Paulette Shrefler, Kathy Rudolph, Laurie Faliano, Sam DeLeo, Kristin Baldwin, Kelly Mortensen, Steve Wielgosz, Chris Wint, Cheryl Schmid and Theresa Burt, Tony Mulligan, Richard Rosenblatt. 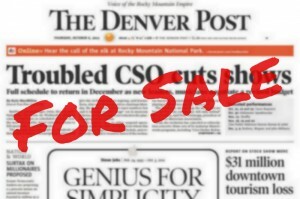 As a District Manager in Home Delivery, I have serious concerns and questions about the proposal by Denver Post management to outsource District Manager and Assistant District Manager positions. I imagine that all of us, even those who have confidence that they might be chosen as one of the “Super Agents,” have concerns about such a change. Due to the difficulty of conflicting and busy schedules that make meeting in person sometimes impossible, it would be nice if we used this forum to discuss these things. “A lot of your questions are asking for detail that isn’t known yet. The company’s written proposal was really just a few bullet points, not a comprehensive plan. We have sent the company an information request, seeking a lot of the detail that you are inquiring about. As talks continue, all of those details will be discussed, unless the company drops this outsourcing plan. The company cannot unilaterally layoff the employees and outsource the work. The jurisdiction provisions of our contract cover the employees and the work. So they can’t unilaterally move the work to non-union workers. That said, if we bargain to impasse, meaning both sides are at their final position, the company could give us their last best and final offer. If it is rejected by the membership, the company can impose the conditions of its final offer. Its not the contract, its just posted conditions. In that scenario, the company could then layoff employees and outsource the work if that action was included in the final offer. “Super Agents” would not be employees, so they wouldn’t be covered by the union. Therefore, the company can refuse to discuss the pay, the selection process and other conditions that they may intend to provide to those distributors. If we do continue negotiating over this outsourcing proposal, we will likely attempt to negotiate those details with management. Management’s verbal explanation of their plan wasn’t much more detailed than their written proposal. In that presentation it didn’t sound like the company planed to provide much support to the distributors. They did say that the Post will retain the leases on the warehouses, and would charge a small sub-lease amount to the distributors. And I assume that they will continue to provide carrier lists. The distributors will be on their own to hire, contract and pay their own employees or contractors and would have to handle their own pay record, tax processing, legal issues and any other business duties and costs that may be needed. I believe it is important for Home Delivery District Managers and Assistant Managers to continue to discuss this as we explore the best options for ourselves with respect to our jobs. Please feel free to express your ideas here.